Among the sprawling Chrysler Group display at the ongoing 2013 North American International Auto Show in Detroit was the 2013 Chrysler 300S Turbine Concept – a slick looking concept car based on the production 300S and fitted with design features that harken back to a vintage model that is well known by Chrysler Group enthusiasts yet likely unknown by others. The Chrysler 300S Turbine Concept was designed by the Chrysler Group to pay tribute to the 1963 Chrysler Turbine Car. Only 55 units of that uniquely powered 2-door hardtop were built as part of a public evaluation program after which all but nine or so were destroyed. As the name would indicate, the 1963 Chrysler Turbine Car derived its power from a gasoline powered turbine engine that spun at more than 44,000 RPM and while this drivetrain was powerful and very durable, it was very inefficient and in the long run, the gross fuel consumption brought about the demise of the Turbine Car. However, the legend of this copper 2-door hardtop that packed turbine power has been forever etched in the automotive history books as one of the most innovative (even though moderately unsuccessful) drivetrain programs of the automotive era. In the 2013 model year, the Turbine Car turns 50 years old and it was with that in mind that Chrysler developed the sharp looking 300 show car shown above on the right. While the 2013 Chrysler 300S Turbine Concept derives its power from a Pentastar V6 engine rather than a Chrysler A831 Gas Turbine, a variety of fitted features help this gorgeous Chrysler sedan pay homage to the ’63 Turbine Car. On the outside, the 300S Turbine Concept features a matte “Turbine Copper” paint that looks absolutely awesome especially when combined with the gloss black painted roof, the gloss black painted headlight and fog light areas, the platinum mirror caps and the bright polished upper and lower grille fillers. The package is completed with a set of 22” turbine blade style wheels featuring a mirror polished face and black painted pockets. Honestly, shy of the fact that the 2013 Chrysler 300S Turbine Concept shown above on the right is copper in color and has the word “turbine” in the wheel design – very little of this Detroit show car has anything to do with the 1963 Chrysler Turbine Car. That is probably a good thing since it is likely that few people have ever seen nor heard of the original turbine powered Chrysler 2-door. However, whether you have any idea what the original Turbine car was, there is no denying that this Chrysler 300S looks fantastic in the matte copper paint matched with the gloss black and silver accents. Matte paint is all the rage right now so it would be a smart choice for Chrysler to offer their sinister and sporty looking luxury sedan in this color, especially after seeing how great it looked wearing the new hue. 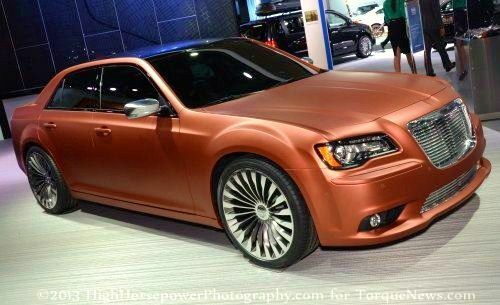 While this may not be a package that ever makes it into the showroom, the 2013 Chrysler 300S Turbine Concept was one of the best looking show cars to grace the floor of the 2013 Detroit Auto Show. Even though the whole world might not be familiar with the original Turbine Car from 1963, there is no denying that this matte copper concept car just plain looks great. Also, when you consider how little is really done to this show car to transform it from your average dealership-spec Chrysler 300 into the slick sedan shown in the gallery on the right (click any of the thumbnails for a closer look), it is hard to come up with a reason why we couldn’t see this package offered – even only in limited figures – in the near future. In addition to the images of the new Chrysler 300S Turbine Concept, the gallery on the right includes a shot of the 1963 Chrysler Turbine Car for those who haven’t seen it before.